I’ve got a fun tutorial planned for today! 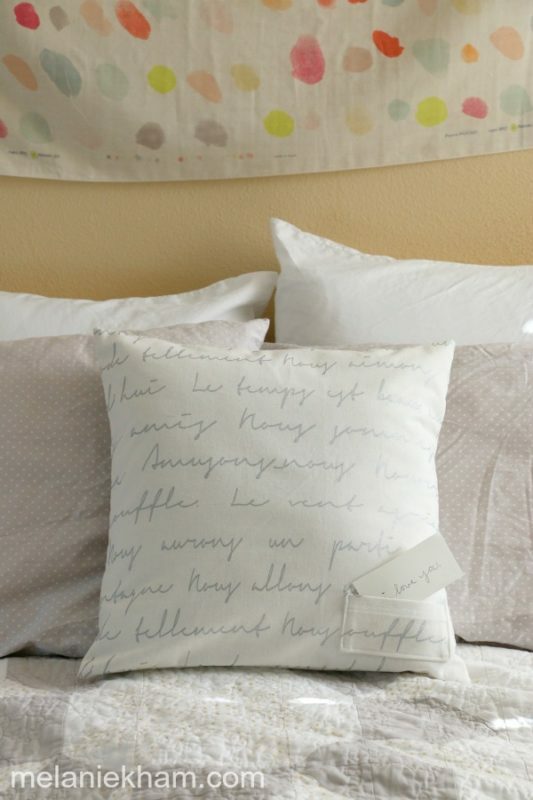 I made this love note pillow for a Valentine’s Day collaboration that I did with Kin Community. 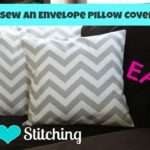 This is a twist on my envelope pillow cover video which is one of my top 10 videos on YouTube. this cute little embroidered heart on the back. What do you think of this project?! Fabric is by Koko Seki found here! 2. 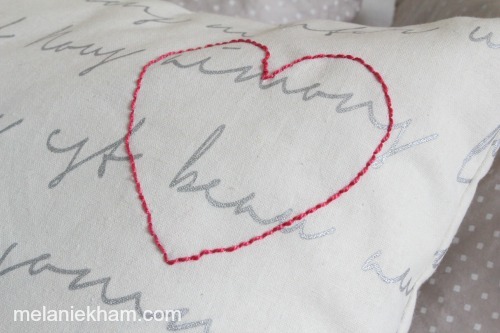 Embroider heart on Piece A as shown or wherever you choose. 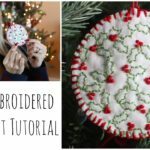 Use a template and backstitch embroidery stitch. Iron when complete. 3. Fold over 2 times, iron flat and pin the top of the pocket, the bottom edge of Piece A and top edge of Piece B to prepare for sewing. 4. Sew the ironed edges of the pocket, Piece A and Piece B. Top stitch the pocket and Piece A. 5. Fold over 2 times and iron the sides and bottom edge of the pocket. Pin to desired location on the front 17 x 17 square piece. 6. Sew pocket down the sides and bottom backstitching well. 7. Place 17 x 17 inch piece on surface right side facing up. Place down Piece A right side down lining up raw edges. Then place Piece B right side down lining up raw edges and pin in place all the way around. 8. Sew with a 1/2 inch seam allowance (about 1.5 cm) all the way around. Be sure to pivot at the corners and backstitch at the openings for extra security. Back stitch and beginning and end. 9. Finish seam using a serger, zig zag stitch or pinking shears. 10. Clip corners. Do not clip stitches. Get about 1/8 of an inch away. 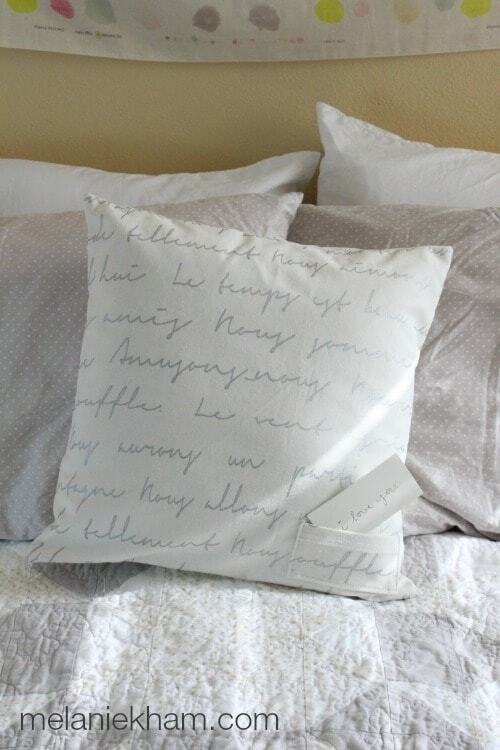 Use your fingers to pop out corners to prepare for pillow form. 11. Turn right side out and insert pillow form. 12. 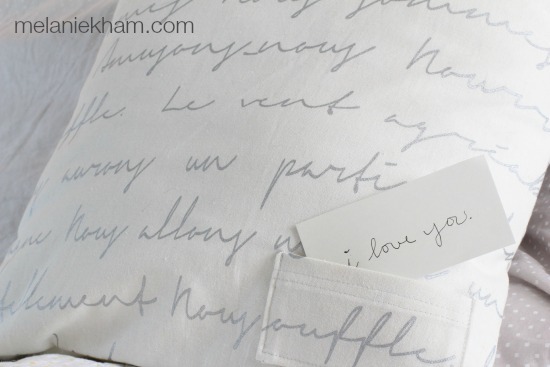 Write adorable love note for your favorite person to find! Here is the video with all the steps! 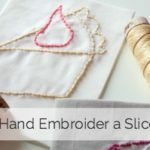 This is a very nice yet modern style sewing project. Two thumbs up!